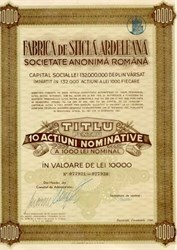 Beautiful engraved Bond Certificate in nice condition from the FABRICA DE STICLA ARDELEANA (1000 Lei) Glass Transilvanian Factory dated 1941 (outbreak of WWII). This certificate has an ornate Guillot frame and underprint with a central shield describing the document. There are also 14 coupons still attached. This certificate is over 58 years old and looks terrific framed!